Former Community School boys' basketball star Daniel Gomis made it official Thursday, Dec. 9 when he signed a letter of intent to play college basketball for Oregon State University in 2011. Gomis will join the Beavers basketball program guided by third-year head coach Craig Robinson, the 1983 Princeton University graduate who has turned around the Oregon State program since his arrival. Last winter as an exchange student from Theis, Senegal at The Community School, Gomis scored 347 points in 17 games and averaged 20.4 ppg with 19 3-pointers for the Cutthroats. Ten times in the 17 games, he tallied 20 points or better. He moved east to play basketball for a boarding school called Oak Hill Academy of Mouth of Wilson, Va. Currently, the 6-9, 205-pound Gomis is a senior forward/center for the 2010-11 Warriors led by 26th-year coach Steve Smith. Oak Hill was the pre-season #1 in high school basketball polls and, with an 11-0 record, is ranked #1 in USA Today and ESPN RISE high school boys' basketball rankings. Oak Hill, a school that produced such NBA players as Rajon Rondo, Carmelo Anthony and Jerry Stackhouse, averages 105.4 ppg. 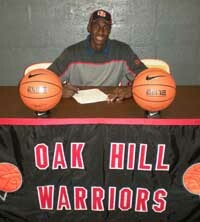 Gomis was one of four Oak Hill Academy seniors signing college letters of intent last week. The others were Quinn Cook (Duke University), Keith Hornsby (UNC-Asheville) and Sidiki Johnson (Arizona). The Warriors carry their unbeaten boast to the Iolani Classic tournament in Honolulu, Hawaii Dec. 17-22.